Dirty Dirt - Our "Dirty Dirt" program is very specific. We offer liability protection for those companies that haul contaminated dirt from gas stations to facilities approved to accept the hazardous material. We will also issue the MCS90 (Environmental Restoration Form). Workers Compensation - For larger companies ($10 million+ payroll), we offer an incredible premium reducing program, in some cases by as much as two-thirds. Our program is loss sensitive and demands a serious risk sharing commitment. Occupational Accident Insurance - We offer our On-The-Job accident program to independent owner operators and fleets with independent contractors. This program is extremely competitive and packed with meaningful benefits. Association Benefits - In addition to the many services that we offer our clients, we also provide membership into the American Highway Carriers Association. 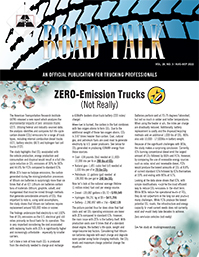 This trade association for professional truckers delivers more than 50 personal and business products and services to its members at group rates. The program includes such benefits as: glass repair, fuel, towing, entertainment, accident kits, scholarships and more. Policy Enhancements - With our in-house market (Williamsburg National Insurance Company), CCIA offers six coverage endorsements to enhance your insurance protection. TOWING ENDORSEMENT: Provides coverage for towing costs up to $1,000 allowing you to have the vehicle towed to a repair facility of your choice within 150 miles, however the vehicle must be towed from the scene of the loss. No deductible applies. UNINSURED MOTORIST PROPERTY DAMAGE: Provides up to $3,500. coverage for damages caused to your vehicle by an uninsured motorist. There must be an identified vehicle/driver for coverage to apply and all other applicable insurance would provide coverage first and foremost (i.e. physical damage). COMBINED DEDUCTIBLE FOR TRUCK AND TRAILER: Combines the physical damage deductible for truck and trailer in the event of a loss. Many policies charge an assigned deductible for the truck and the trailer separately. MISCELLANEOUS EQUIPMENT COVERAGE: Provides coverage for small tools that are damaged as a result of a loss such as tarps, chains, tear downs, load separators and miscellaneous hand tools for a limit of $500 per tool and a total limit maximum of $2,500. (No deductible applies). RENTAL REIMBURSEMENT COVERAGE: Provides payment for a rental unit of $175.00 per day up to 15 days for a maximum payment of $2,625.00. Physical damage coverage must be carried on the unit that suffers the loss in order for coverage to apply. No deductible applies. COMPREHENSIVE COVERAGE: Replaces ‘’specified causes of loss” on the physical damage policy thus broadening coverage. Does not require a specific cause for coverage to apply, i.e., fire, theft, CAC. Coverage responds to any peril other than collision or upset.